New York, NY – October 2016 – Award-winning tableware manufacturer, Portmeirion® Group, introduces the dramatic and beautiful new Botanic Blooms Collection, a dinnerware and serveware collection perfectly suited for the Millennial bride and collectors both young and old. 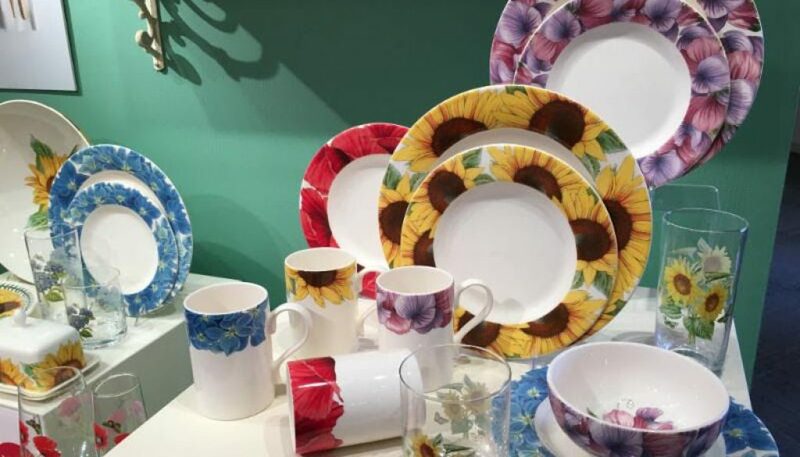 Bold and bright, Botanic Blooms brings color to the home with Sunflower, Poppy, Hydrangea and Sweet Pea motifs blossoming across this stunning tableware collection. Inspired by the iconic Portmeirion Botanic Garden range, Botanic Blooms is a modern, up to date interpretation of Botanic Garden exuding sunshine and happiness for casual entertaining. Each dinnerware piece is carefully crafted in the UK and features a large botanical design. Developed to stand alone or pair perfectly along side the existing Botanic Garden range, Botanic Blooms Collection features dinnerware and accessories ranging from $19.99 to $59.99. Items in the Collection include 11″ Dinner Plates, Salad/Dessert Plates, Rimless 5.25″ Bowls, 12 Oz Mugs, assorted size serving bowls, Covered Butter Dish, Sauce Boat, 14″ Oval Platter, Storage jars, Salt & Pepper and Oil & Vinegar Sets, and multiple size Beverage Jugs. For more information about Portmeirion Botanic Blooms, Portmeirion Botanic Garden, or the complete line of tabletop products from Portmeirion Group, visit www.portmeirion.com. Portmeirion was founded by legendary ceramic designer, Susan William-Ellis in Stoke-on-Trent, England in 1960 and has remained at the forefront of contemporary design ever since. Portmeirion is part of the Portmeirion Group which encompasses the Portmeirion, Spode, Royal Worcester, Pimpernel brands and the newly acquired fragrance candle company Wax Lyrical. Renowned for its tableware, cookware and gifts, Portmeirion Group provides consumers with beautiful and unique collections made to the highest standard that can be used and enjoyed every day. www.portmeirion.com. For updates follow Portmeirion Group on social media.